Trina Nauman, Senior Project Analyst - Procurement Solutions, Inc.
Trina Nauman joined PSI in 1997 as a part-time Junior Analyst. Through her knowledge of GSA Schedules and proposal writing skills, she quickly moved into a full-time Senior Project Analyst position. Trina has worked on numerous government projects and GSA proposals. Her strengths are in her knowledge and experience as a project and GSA contracts manager. She has provided strong customer service and support to all PSI clients in the areas of contract maintenance, identifying problems and implementing solutions, proposal development, GSA liaison and contracts management. Trina assists marketing and coordinating Trade Show events for PSI. She coordinates and conducts visits to client sites for data gathering, training, meetings and Contractor Assistance Visits (CAV). Trina also assists clients with Small Business Subcontracting Plans, ISR, SSR and ESRS reporting. Trina has over 12 years experience in GSA Schedules and her background includes proposal writing along with administrative experience. 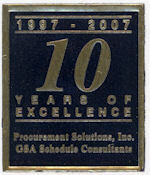 She is an integral part of the day to day success of Procurement Solutions, Inc. and its clients.